Avitus KWS has been heralded as a “break-through” variety, pushing the boundaries of early hybrid maize breeding by producing unrivalled yields for its maturity segment, with its performance in the latest KWS official trials showing yields of 19+ DMt/ha. The variety’s starch and ME levels are equally impressive and among the highest of all the modern hybrids, at 35 .5% and 11.6 MJ/kg respectively. Suitable for both livestock forage and biogas production, Avitus KWS, which has an FAO of 160/170, is the first choice for growers looking for an early harvest, requiring fewer heat units throughout the season to reach full maturity; it has moderate staygreen abilities, for faster ripening . The variety’s other positive attributes include excellent early vigour and full cob sheath coverage, as well as good eyespot resistance. 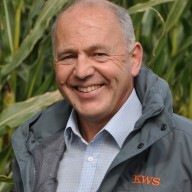 Andrew Hockridge has been growing maize on the family dairy farm for more than twenty years and first planted Avitus KWS at High Park Farm in its debut commercial season in 2017. The variety was recommended due to its very high yield and starch potential, along with its rapid early vigour. That is important to Andrew and his son, Peter, who milk 250 pedigree Holstein Friesians which are fed on maize silage throughout the year. They have found a crop management system which works well for them. The farm’s soil sampling programme, which tests each field every three years, is an essential element of the regime, stresses Andrew. Chemical sprays are used sparingly, to save on inputs. Due to maize’s dislike of competition, the Hockridges feel it is worth investing in a robust weed control plan and a pre-emergence herbicide is followed by a post-emergence treatment at three leaves. “Maize silage is a fantastic feedstuff for dairy cows and we feel very fortunate that it thrives in our farm situation,” says Andrew.